On the eve of Valentine’s Day, in 2014, a storm closed in around Boston, blanketing the city in snow. The customer support and engineering teams at Acquia were hunkered down, working a late night and preparing to switch on Zendesk Support. Acquia, a digital experience company, wraps everything they do around an open source web content management platform called Drupal that helps organizations achieve their most aspirational digital initiatives. Acquia’s own digital experience recognizes that support isn’t an outlier in the overall customer experience. Only two months prior, Acquia’s leadership made the official decision, following an in-depth vendor selection process, to switch from their old system, Parature, to Zendesk Support after vetting more than 12 solutions. As luck would have it, all of Acquia’s engineers had traveled to Acquia’s headquarters for their annual onsite that includes a hackathon competition. Nine engineers applied themselves for the week to what was called “Project Houdini” and, together with a core team, set to work building custom integrations between Support and Drupal. For the short term, they worked on their highest (or “most lovable”) priorities and requirements, and slated other features for a later deployment. By deploying in phases, the team was able to work rapidly and iteratively to understand how Support worked at Acquia, and to create new tools to support their implementation. “It was like making magic out of the impossible,” Finks said in explanation of the project’s code name. “The idea of taking a heavily-used system, transitioning everyone out of it, and making everyone adopt and learn a new system so quickly was a major feat.” To support the launch, Finks and other leadership created a go-live playbook, and equipped the staff with multiple training sessions and documentation. And that hackathon competition? Project Houdini took first place the following day. The hackathon project-turned-Zendesk-implementation was not the engineering team’s first exposure to Zendesk Support. Finks had included engineering during the vendor selection process, specifically to evaluate Zendesk’s API. “We want to provide customers with the best experience possible, no matter which channel they come through or which product they’re engaging with us on. One reason we chose Support is because we knew that the strength of the API was going to be vitally important for us to do that,” Gale said. Both the engineering and customer success teams agreed that Support could satisfy Acquia’s core support needs and that the API was flexible enough to build out additional, customized functionality. While their previous system had once boasted a feature set that met their needs, the product had failed to evolve. In particular, the API was “clunky” and might involve 20-40 calls for a single task, and they often hit the API rate limit. The UI was inflexible, and reporting was difficult and forced them to build an alternate reporting system on Drupal. “Zendesk’s robust API has enabled us to customize our customers’ and teams’ experiences. It easily integrated with the powerful systems we already had in place,” O’Keeffe said. 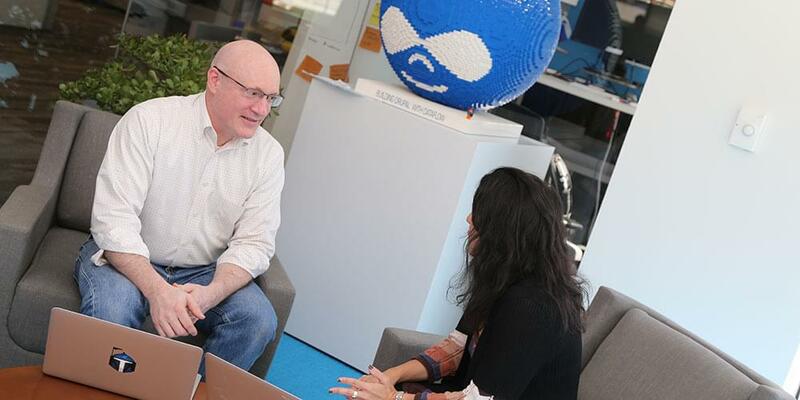 In the time since launch, Acquia’s relationship with Zendesk is going strong. The global support team, numbering approximately 65 people, and the extended customer success organization, about 150 total, all use Support for a single, integrated, and comprehensive view of Acquia’s customers. Support has helped support leadership to streamline internal processes and to improve the customer-agent experience, resulting in a 25 percent increase in CSAT, and a 25 to 30 percent increase in agent productivity. The real-time reporting with Support’s analytics has also helped Acquia to identify critical business issues and to take action. The support team relies on “an extensive amount of reporting,” as Gale put it. They have a dedicated resource to slice and dice the data in a variety of ways, from reporting on response time SLAs to customer segments to agent time-tracking to really granular reporting on SLAs across urgency levels, region, time of day, and so on. Put another way, Gale explained, they look at reporting from a couple different dimensions: “How are people performing?” and “What are customers asking us about?” They look at volume, customer impact, root cause, and time spent—and are now able to identify trends.